The Pool Gurus are a family owned business that provide all manner of pool services between Burleigh Heads and Ballina. This includes but is not limited to pool cleaning, servicing, maintenance and pool products! Laurence Cook, the founder of The Pool Gurus, has over 10 years of experience in the pool solutions industry. 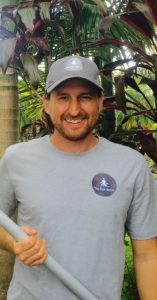 He started his company on the Gold Coast and has developed his passion and knowledge for pools over the years and is has now relocated to the Byron Shire. Laurence’s experience ranges from repairs on all major pool brands, pool construction, R and D of major brands, pool servicing and maintenance. If you are looking for an honest, highly qualified, affordable and friendly pool company, look no further. Our team of experts provide services in the the Gold Coast, Byron Bay, Mullumbimby, Banora Point, Burleigh Heads, Tweed Heads, Kingscliff, Potts Point and Ballina regions. We are experts in high quality and long-lasting pool solutions. If you love your pool and want to get the most out of it don’t hesitate to contact us on our contact page, we are always happy to help with any of your pool solution needs.